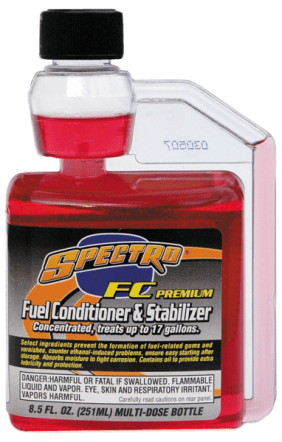 Formulated specifically for use in high-performance motorcycle and other small to mid-size high output engines, Spectro FC Premium helps you ensure top performance and easier maintenance from season to season. It is suitable for all forms of gasoline-fueled engines, from everyday lawn equipment to superbikes. It fights corrosion and varnish build-up, and counters ethanol-accelerated corrosive problems within your fuel delivery system. Inhibits corrosion and provides lubricity. prevents the formation of fuel-related gums and varnishes for easy starting after storage.